Located just a stone’s throw off of the mainland along the southern Turkish coast between Olu Deniz and Gocek Bay, Gemiler Island is a must do stop on a charter yacht itinerary along the Turquoise Coast of Turkey. 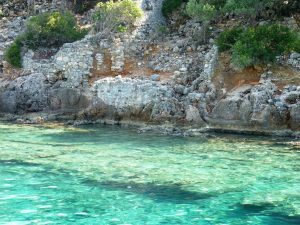 With a protected anchorage between Gemiler Island and the mainland, Gemiler Island is also a natural stop on a charter yacht cruise along the Turquoise Coast of Turkey. 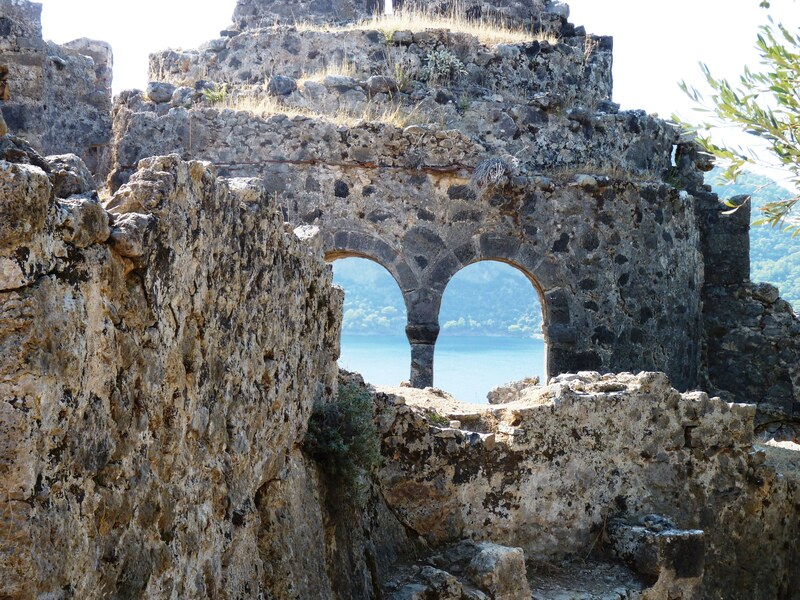 On a crewed charter yacht itinerary, stop and anchor at Gemiler Island either for an afternoon or an overnight for a snorkel over ancient sunken ruins in the anchorage or a hike ashore through the plethora of ancient ruins littered across the landscape. Gemiler is quite a small island, really one big hillock almost straight up and down, in easy swimming range of the mainland. 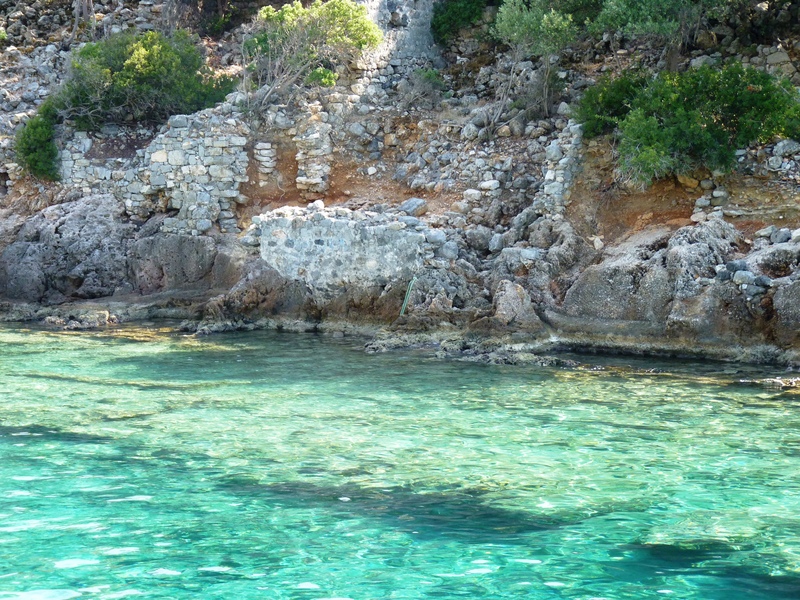 Tucked in behind Gemiler Island and the mainland is a natural protected anchorage, which is a great location for a refreshing swim over ancient sunken ruins before climbing along the paths of the island to explore the Byzantine ruins, or to cool off in the waters after a vigorous island hike. 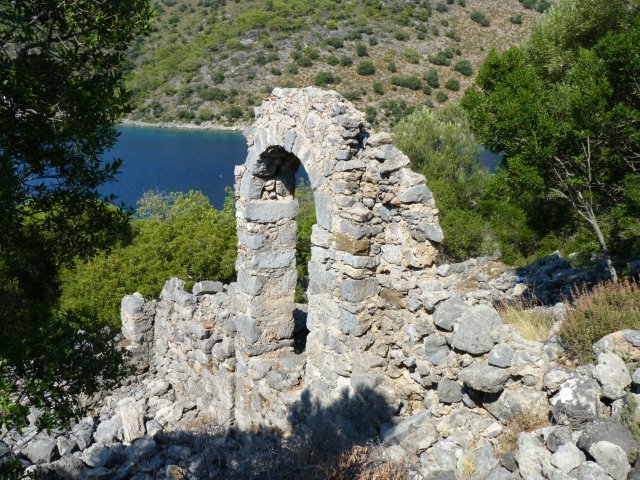 Gemiler Island, for such a small island, has been well inhabited during ancient and Byzantine times, and although uninhabited today, the ruins of these many centuries of life on the island are very much in evidence today, both on the island and sunken in the waters of the anchorage below. Much of the known history of Gemiler Island is the Christian History from around the 4th century A.D. to the 12th century, which would have been the end of the Ancient Period and into the Byzantine Period of history along this coastline. When entering the anchorage between the mainland and the island, ruins of many structures can be seen sprinkled along the top and hillsides of the tiny island. Along the anchorage side at the base of the island, are the remains of what was a busy little harbor front, with building walls dug into the rock base of the island and ruins of foundations extending into the waters today, very reminiscent of the Lycian, Greek, and Roman ruins found further along the coastline towards Kekova. Snorkeling over these ruins is a treat, as the water is shallow, very clear and warm, and when swimming over the area along the shore, foundations of small rectangular rooms in interconnected buildings that were jumbled along the harbor front can clearly be seen. Here and there when snorkeling in this area, one can see old terracotta tile shards, maybe from old jugs, or maybe from roofing tiles, however, as always, best left in situ in the water as telling remains of civilizations long gone. Gemiler Island was a very important Christian Island, and contained, at one time, 4 Byzantine churches bunched together in this small space. It is said that St. Nicholas lived and preached on this island in his lifetime, and that this island was an important stopping point for religious crusaders heading east towards Jerusalem. 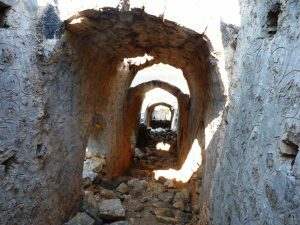 Around the 8th century AD, the villagers on Gemiler Island living in the town of Levissi, after repeated pirate attacks, started moving to the mainland and established the new town of Levissi. 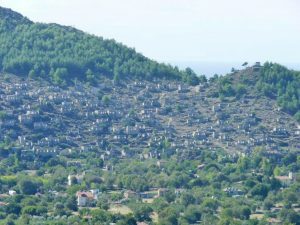 Levissi, now called Kayakoy was a prosperous Greek town with approximately 2000 inhabitants when in 1923, at the end of the Greco-Turkish War, all Greeks were required to leave Turkish land and swap living locations with Turkish people required to leave Greek land, no matter how many centuries the families had been living on that particular land. 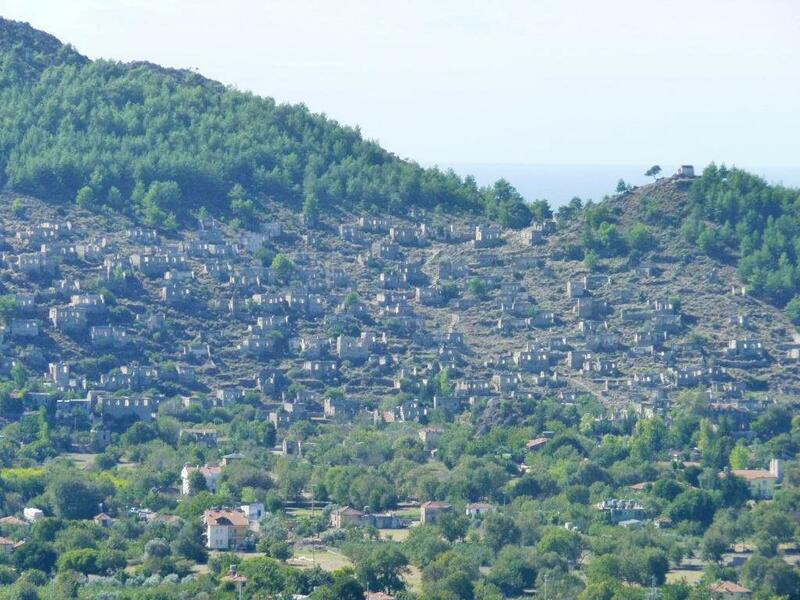 Initially, disposed Turkish families that moved from Greece inhabited Kayakoy, however none stayed and eventually Kayakoy became the ghost town that it is today, totally abandoned, except for a few goats. If wanted, when anchored off of Gemiler Island, you can visit the ghost town of Kayakoy, as long as you are prepared for a good uphill hike along the mainland from the anchorage area between Gemiler Island and the mainland, in order to see the remains of the town where the inhabitants of the ruins of Gemiler Island relocated for a number of centuries before being required in the 20th century to relocate again.